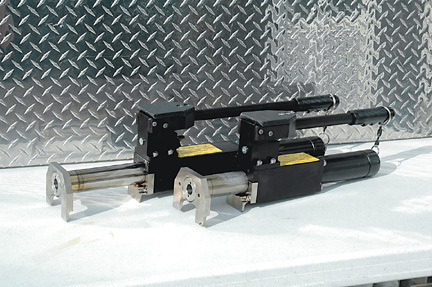 The "Hydra-Ram®" is the first and only one piece integrated hydraulic forcible entry tool. No hoses or auxiliary pumps to leak or trip on, and can be operated by one person. 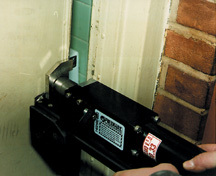 - A patented process incorporating integral aircraft seals or triplex quality is used to prevent leaking. - Fluid is non-flammable, non-toxic and non-freezing. - Special stainless steel jaws are made of 220,000 tensile strength. - Body is special aluminum heat treated and anodized to a color of tactical black. - Special finger grips for a non-slip holding surface. - 10,000 lbs. of force at 138 lbs. 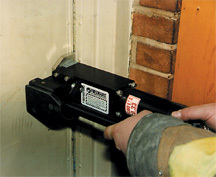 or pumping acquires 3/4" opening per stroke to maximum opening of 4 inches (HR I) or 6 inches (HR II). - Can be placed in any position even upside down without any effect on its operations. - Takes only seven pumps to achieve the 4 inch opening 8-10 pumps for 6" opening.